Have you thought about how you’re going to attack your holiday cookie plan this year? Do you have your basic dough made? If not, don’t worry. I haven’t either. While I’ve made all 12 of this year’s recipes, I only did that because I had to photograph the collective group for the last post. Seriously. I muscled my way through them all the day before Thanksgiving so while I wouldn’t recommend it, it is possible. I still have a few to tweak but thankfully those won’t post toward the end. As it is, I am writing this post a mere half hour before it goes up and haven’t started writing numbers 2-12. I suspect they’ll get done on the wire too. That’s just how I roll during the holidays. And I haven’t started my regular cookie baking. Oh well. It’ll all get done. It always does. The postman might not deliver those cookies until New Year’s but so be it. I refuse to have a meltdown this year (she says now.) Commence meltdown. What the hell … let’s go! So take a deep breath and start out with an easy one. All you need is the basic dough, a jar of jam and a little extra butter, flour and sugar. A mini muffin tin too and a round cutter would be nice. 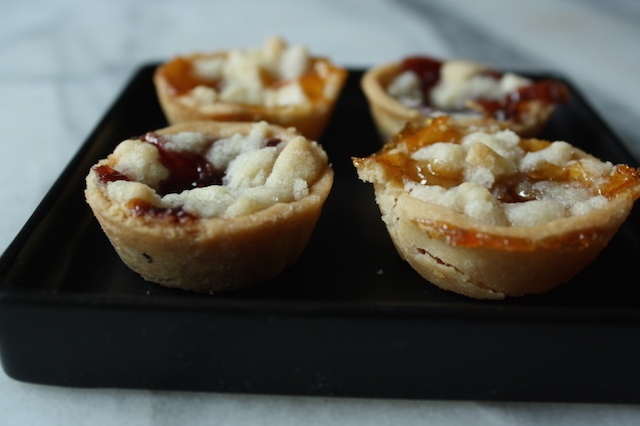 Cookie #1 for 2018 is Jam Streusel Tarts. Aren’t they darling? Roll the dough thin between two sheets of lightly floured parchment paper or plastic wrap. This is much, much easier when the dough is room temperature. Remember: roll warm, cut cold. Roll that dough when it’s warm and pliable, pop it into the fridge for 15 minutes or so to chill (or longer), then cut neat little rounds. My mini muffin tin is 1 ¾” across the top and 1 ¼” on the bottom and a 2 ¼” round cutter makes exactly the right size circle. Play around to find the right sized cutter for your pan. When the dough is still a bit cool but pliable ease it into the tin cavity, fitting it nice and evenly into the opening. This will probably take a bit of practice. Don’t fret, the dough is forgiving and can be rerolled a few times. Now I have to mention the traditional method for making these types of crusts is to take a ball of dough and press it into the pan, smooshing it this way and that to fill the cavity. You can certainly do this but I’ve never really been happy with the inevitable unevenness this method delivers. But yes, it certainly works and isn’t nearly as fussy as this fancy pants pastry chef technique I’m telling you to do here. Do what works for you. Just make sure you chill those things once in the pans until they’re nice and firm. While your dough is chilling, make the streusel. Actually, make it first so it’s nice and cold when you need it. This involves mushing together with your fingers some butter, sugar, flour and a bit of salt. No big thing. Maybe if you like throw a pinch of cinnamon or nutmeg in there. But only if you feel like it. I kind of like it plain and buttery. 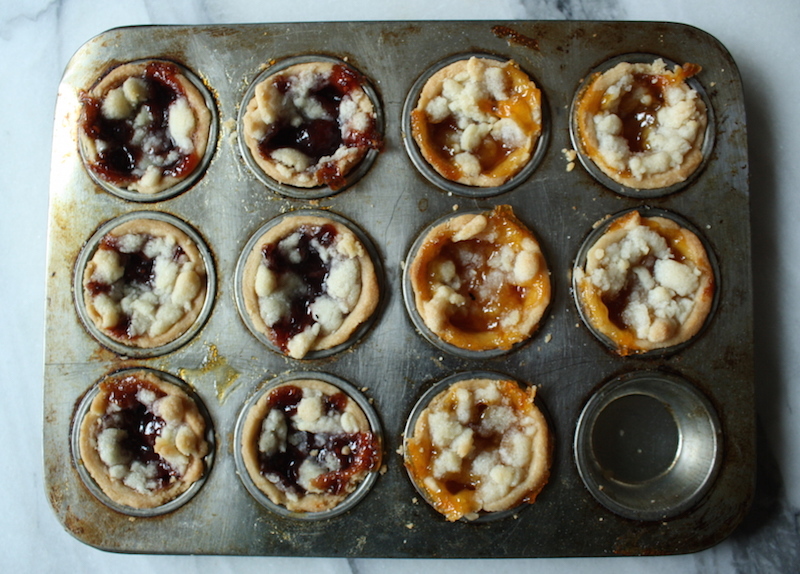 Fill those chilled little tart shells with jam, whatever flavor you like, then crumble that cold streusel on top. 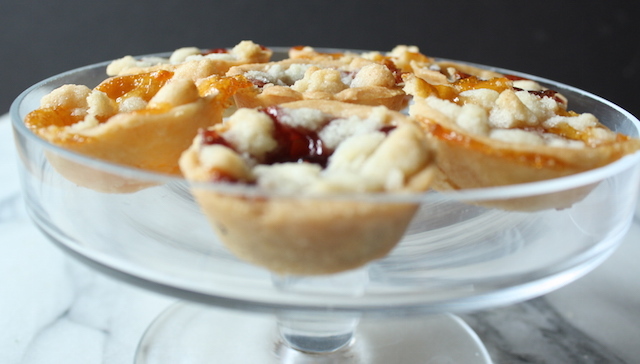 Bake until golden and you’ll have the prettiest little tarts around. STRESS THERAPY BAKING FACTOR: IT’S A CHRISTMAS MIRACLE! No one needs to know that you made these specifically to use up your massive collection of nearly empty jam jars stashed in your fridge. Shhhhhhhhh. A mix of jam flavors really is best anyway. For the streusel: in a bowl, whisk the flour and sugar. Between your thumb and first two fingers, rub the butter into the flour/sugar mixture until crumbly and holds together in big clumps. Refrigerate until needed. (Can be made ahead and frozen up to 2 months). For the tarts: Between two pieces of lightly floured piece of parchment paper or plastic wrap, roll out the room temperature dough to 1/8” thickness. Using a 2 ¼” round cutter (or whatever size works best for your tin), cut out rounds, rerolling the scraps as necessary. Gently press 1 pastry round into each mini muffin tin cavity. Gently ease the dough in starting with the sides. If the dough cracks/breaks, simply patch up with a bit of extra dough, pressing into place. Preheat the oven to 375°F with a rack in the lower third of the oven. Bake on a parchment lined sheet pan until the pastry and streusel are light golden and filling is bubbly, about 15-18 minutes. Be sure to rotate the pan halfway through baking. Make ahead: You can make and freeze the streusel for a month or two. As mentioned above, you can fit the dough into the muffin tins and freeze them, tightly wrapped, for up to two months. Or you can roll and cut the rounds and freeze between pieces of parchment paper until needed. Let the round defrost until pliable before continuing.